I’ve always wanted to be a photographer but doodling on my phone camera and my new Instagram account will have to suffice for now. But I’ve been particular intrigued by the role of photography in humanitarian and various aspects of global development. This is why I was intrigued by an article that came through my reader about an Afghani photographer named Massoud Hossaini who was awarded the 2012 Pulitzer Prize for Breaking News Photography. Tthose were my initial thoughts. Understand? My thoughts were to escape this reality and pain rather than entering in to better or more deeply understand the story and pain. If you do click and see the image, what were your first thoughts? How do you respond to such utter pain? This image will be now with me forever. While I missed this image when it was first captured on December 6, 2011, it will be with me forever. So, I warn you…before you click “read more” … know that you will be disturbed. While my intent in sharing this photograph isn’t for the purposes of “shock and awe”, I think that all of us need reminders (however they come) of the broken and fallen world that we live in. While we clearly need to reminded of the other spectrum of beauty and hope, it’s possible that sometime we limit our view of the world to “I am so blessed”…that we forget we live in a fallen, broken, and evil world and that we have work to do. I say this not to be a voice of fatalism or utter hopelessness but a reminder that the world is not what it ought to be and that God promises to restores all things but we have to be a part of that work. And as such, we not only rely on God and the mercy and grace of God, but we must commit ourselves to Peace, Hope, and Love. As a Christian, I long for the return of Christ as He restores all things but till then, we partner with God to work towards that restoration. As for the photographer Hossaini, he is fortunate to be alive. He was “just yards away” when the bomb – via a suicide bomber – went off on December 6, 2011 in Kabul, Afghanistan. The bomb killed anywhere from 54 to 70+ people (depending on sources). Don’t escape. Sit in this pain. I invite you and challenge you to sit in this pain, discomfort, and brokenness and ask you to join me and others in not only praying but living out our lives as peacemakers and reconcilers. Click on the image. Sit with it. Stay wit hit. Cry with it. Be angry. Look at the faces – recognized or unrecognized – of each baby, child or person in the high resolution photograph. But I ask you…don’t escape it. It was the Shia Muslim festival of Ashura, the day Shias mourn for Imam Hossain, their third imam and the grandson of Prophet Muhammad. The imam was killed with his family during a war in 680 CE. 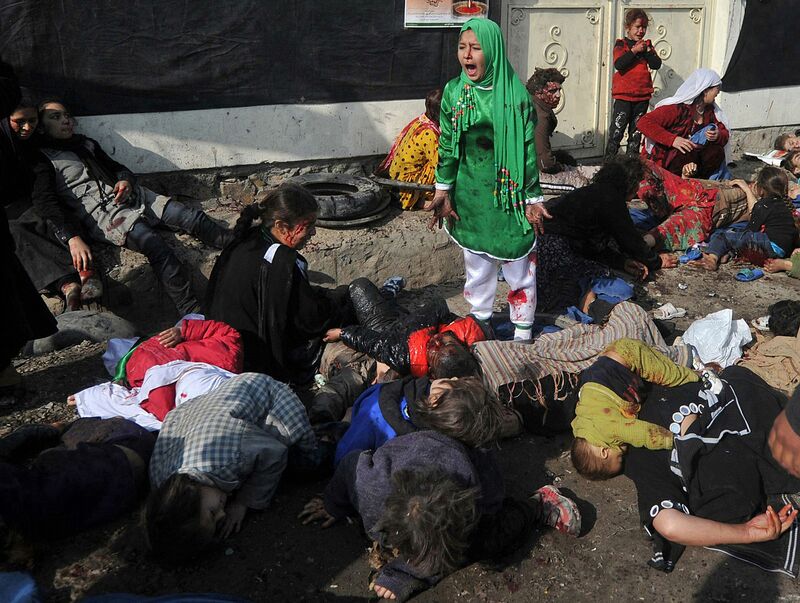 To mark the day, children wear green dresses to show their sympathy with the imam’s children, who were also killed. Taraneh, the girl in the photograph, “had begged her parents to get her a green dress for Ashura”, Massoud Hossaini, the 30-year-old photographer, told the BBC. Though the family is not wealthy, they granted her wish. It was the green dress that attracted Hossaini’s attention at the start of the festival, a parade through the streets of Kabul. Shortly after, a suicide bomber sat down in the middle of the crowd and blew himself up. “Wars are poor chisels for carving out peaceful tomorrows.” – Martin Luther King, Jr. I don’t know how quite to write this appropriately but click on the image if you want to view it in high resolution. Previous Door prizes, iPads, pony rides, and gazillion eggs for Easter when the Gospel ought to be enough. Next Dear Pastor Charles Worley: We condemn your words of hatred and cruelty. Repent! No words….praying through the tears. Thank you for sharing this, Pastor Eugene. Maybe sometimes images like this should be shown to let people know exactly what kind of world we live in. Unimaginable terror. Lord have mercy. What a heartbreaking photograph. I know it’s going to stick with me for some time, but I’m not regretting the fact that I chose to look (after all, you warned us!). On the contrary, I think that more people need to be made aware of this type of pain and tragedy. Thank you for being brave enough to post this picture for your readers. When we become so desensitised that we cannot enter into someone else’s suffering, then Satan has truly succeeded in taking the heart of Christ from us. It seems so impossible to have a heart that is both compassionate enough and resilient enough to walk someone’s suffering with them. Yet, Jesus did that very thing by entering into our world and defying death’s sting for us. Whenever I see or hear of things like this, it is a severe challenge to stay in that moment. I pray we may all have our minds renewed by God, our hearts reclaimed by His sacrifice for us… and may we see the world the way He does. Else, we will detach, separate, isolate, and insulate trying to keep the fallenness of our world from finding us. My heart breaks for those in that situation, there aren’t words to express or explain. Jesus wept for many things, the fallen and broken reality where His beloved suffer was at the top of that list. Thank you for both the challenge and the example. Terrible but I am glad you bring it to our attention. May God have mercy. Thanks – I’ve seen more of these type of images than I wish were possible. Especially as a parent they strike deep. But I agree with you – it’s important for us North Americans to keep our First World problems in perspective. And important to understand the role we have in such violence, but even more important to know the role we have to start the healing. …Thanks for sharing the context. I admit to being a desensitized American and self-protecting by not caring to look deeper, to know more or to just be plain old overwhelmed by the “problems of the East.” But the context is what made me sit in the sorrow…seeing that dead toddler laying head down on his Mama…that got me. I have a 2.5 yr. old, so yeah, it got me. It’s a good good reminder to pray for God’s mercy and peace to permeate this earth! There are so many horrific tragedies that have overwhelmed societies over the ages. It has a sobering affect that makes us pay closer attention to our own depravity. Will this experience drive these people into the arms of Jesus? Are their even Saints ready to comfort them and reveal the Love of God in the midst of their traumitized lives? I pray for their sake the Lord will send labourers to them. It makes me sick that I am viewing this on my $600 iPhone, sipping on a $5 coffee from Starbucks under the security of having a stable job living a comfortable middle class life in the richest and most isolated country in the world. And my problems consist of wondering when I can buy a new camera body or that 70-200. I don’t even know what to say. My heart aches for these people. Their pain and suffering is something so foreign to most of us in the West living in our plastic bubbles. It’s just not right. My son was walking down to the beach through the woods today and found a friend hanging dead in a tree. The young man took his own life, thinking that there was no hope. And my son will, like you Eugene, and all who have seen this photo, never get that image out of his mind. I cannot take it out for him. I cannot take his pain from him or from that poor boy’s family, but we have a God who moves mountains and I am trusting Him to work and glorify Himself in this awful tragedy. We must trust him for Tarana, her family, and for this photographer as well. If we turn our heads and never look into the face of terrorism, then we are like the ones who walked on the other side until the Good Samaritan did look, and did, act. Yes this is a heartbreaking photo, but we can share the pain of this child, the people impacted in all ways and do something – if it only to be informed – this is a beginning. Thank you for posting this.